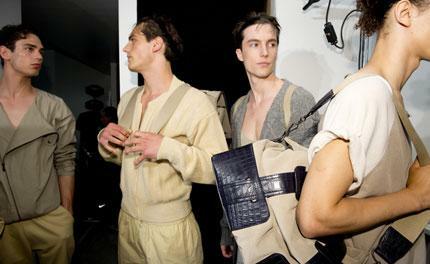 Tomas Maier said his spring collection for Bottega Veneta was 'inspired by the body in movement'. Though he never mentioned a specific sport, it's safe to say that he had no intention of mining the grunting, brusque moves of American football, for example. Rather, Maier seemed fixated with the graceful motions of the male ballerino. He slid several of his men's feet this season into sole-less black ballet slippers or patent toe tap shoes and slicked their unruly hair back with elastic headbands. Paint-washed knit sweaters were cut like boxy work-out tops and the baggy legging became the new trouser in traditional knit forms or more unusual, technical jersey. Classical, crinkled suiting featured pants ruched up the leg as if in mid-work-out, while wide shorts had the cut of a boxer's uniform. The mood this season was obviously a departure from Bottega's formal past but, even when Maier focuses on sportswear, the effects are supremely considered. Jacket elbows were reinforced with darning embroidery, his windbreakers had asymmetrical cross-body zips and fabrics were weathered, faded and washed with an impeccable hand.